"Strangely, bitcoin seems to be the poster child for social mood and market mood," Jeffrey Gundlach, founder of DoubleLine Capital, told CNBC's "Halftime Report." 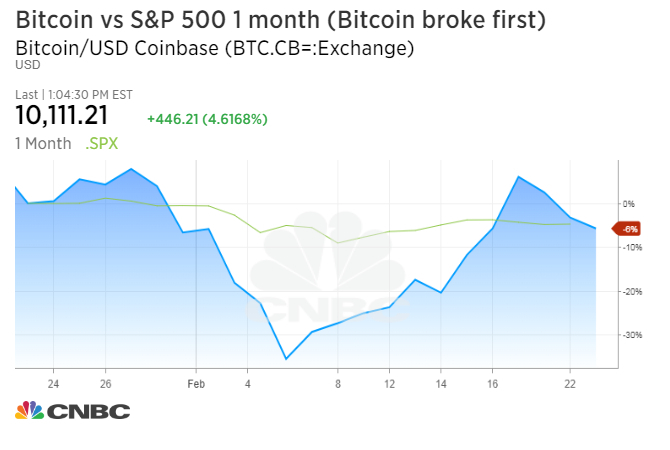 "If stocks are going to take another tumble, I think it would be preceded by a bitcoin decline," he said. Stock market volatility was reawakened from its dormant state earlier this month, with the major averages briefly dipping into correction territory. Want to know where stocks are going next? Jeffrey Gundlach says take a look at bitcoin. "Strangely, bitcoin seems to be the poster child for social mood and market mood," Gundlach, founder of DoubleLine Capital, told CNBC's "Halftime Report" on Friday. "We had a vertical rise from Sept. 7 which was led and epitomized by bitcoin. Bitcoin started at about $4,500 and went up to about $20,000 or so." "Bitcoin peaked out in mid-December and it crashed. That sort of presaged the volatility in the stock market," he said, noting the cryptocurrency has stabilized recently. "If stocks are going to take another tumble, I think it would be preceded by a bitcoin decline." Stock market volatility was reawakened from its dormant state earlier this month, with the S&P 500, Dow Jones industrial average and Nasdaq composite briefly dipping into correction territory. Meanwhile, bitcoin has stabilized between $8,000 and $10,000 since Feb. 8, according to Coindesk. "Weirdly, I'm actually using the sentiment regarding speculative assets like bitcoin as a guide to maybe what the future will bring," said Gundlach. He also told CNBC in December that investors betting against the digital currency then would "make money," calling it "kind of nutty stuff." Gundlach is one of the leading bond managers, often referred to as the "bond king." Earlier Friday, Gundlach expressed doubt that wages can go up without sparking a sharp increase in inflation. Concerns about rising inflation sent stocks reeling earlier this month, after the Labor Department reported much higher-than-expected annualized wage growth.